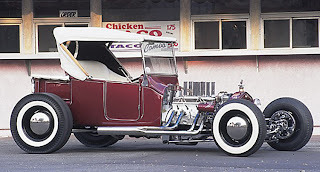 1957 Chevy man. 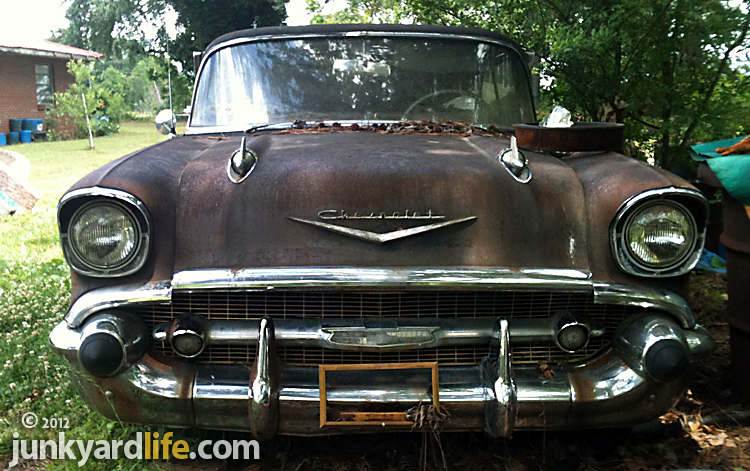 “Buck” Hitt, of Blount County Alabama, was known for his love of 1957 Chevys. Buck owned more than a dozen 1957 Chevrolets during his decades old love affair with the iconic symbol of American automobiles. Convertibles, hardtops and sedans could be found surrounding the home where Buck lived with his wife, Wanda, for more than 50 years. It was no accident that his street address and the last four digits of his home phone number were 1957. The car and the number became synonymous with Buck. 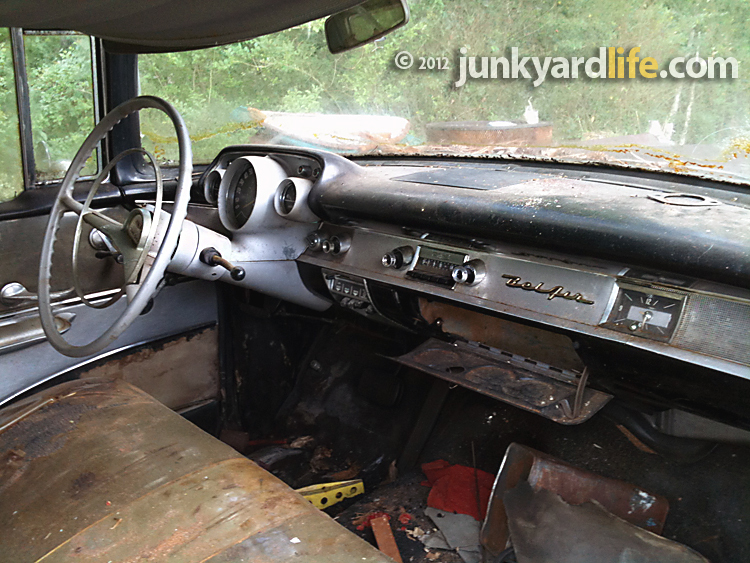 Interior of Buck Hitt's 1957 Chevrolet Bel Air is loaded with options. Buck’s black, 2-door hardtop, Bel Air was a source of pride for him as a young man. 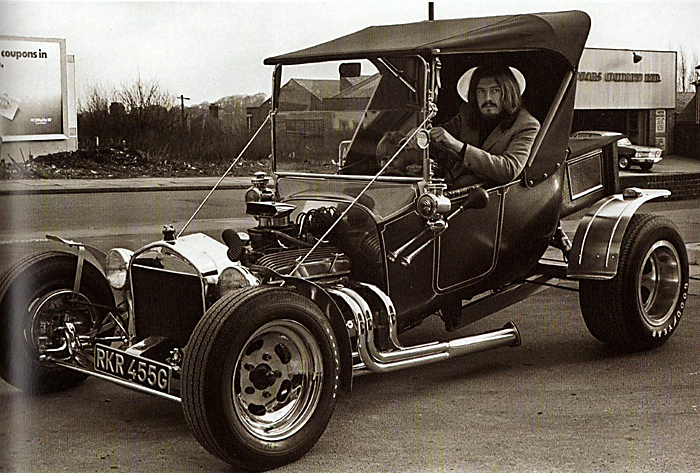 That same car gave him peace during his most difficult days as he lost his vision and battled illness. Buck passed away last year, in March 2011. His wife, Wanda, struggled to let go of his cars, knowing she could not take care of them. 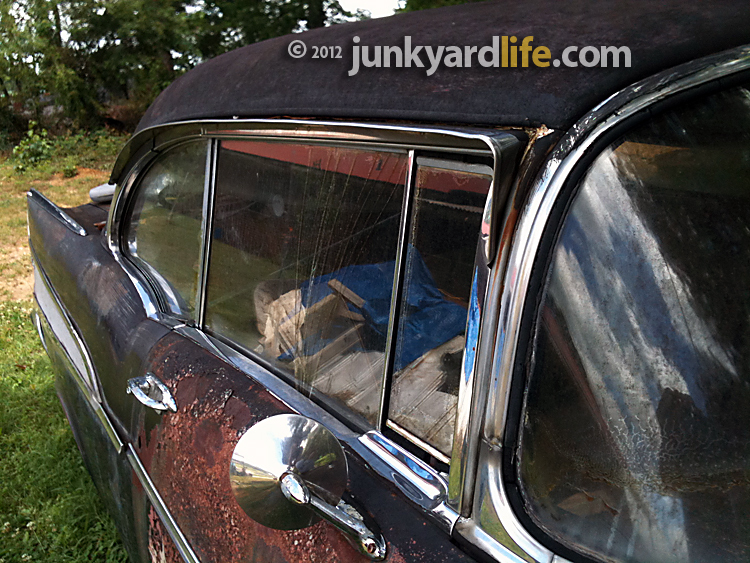 1957 Chevy Bel Air chrome window moulding shines. 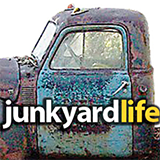 Soon after Buck passed away, dozens of his automotive treasures were sold. Neighbors and passersby offered to buy the dozens of classic cars and parts that Buck had collected. 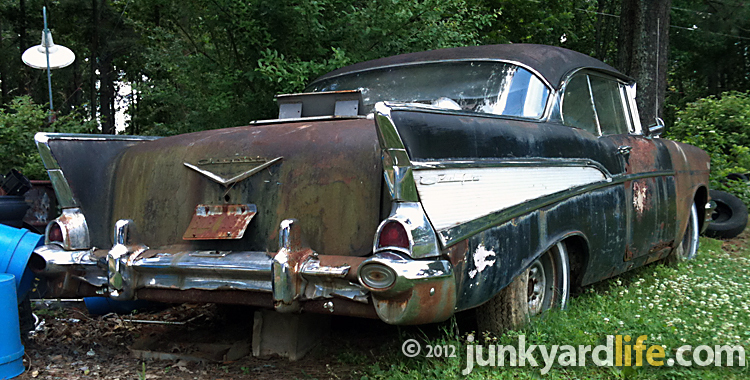 One lone 1957 Bel Air remained behind the house. Wanda couldn’t bear to let it go. 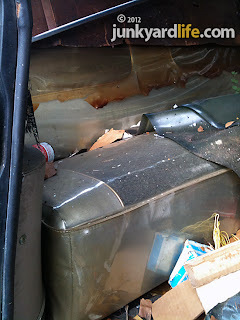 Rust-prone area between rear bumper and trunk is solid. She said “No” each time a stranger pulled into the yard to make an offer. All had a price, except the black, 2-door hardtop, Bel Air that Wanda and Buck had driven many years ago. There’s no question that Wanda still loves Buck when I looked into the pained expression on her face. “I’m just not ready to let go of the car that Buck loved,” said Wanda. 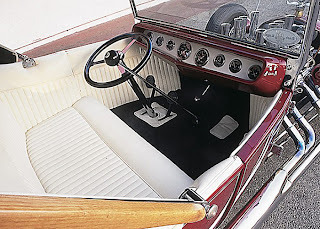 Bubble seat covers preserved the interior of Buck's ’57 Chevy. Buck’s black Bel Air has vintage plastic seat covers on the silver and black interior. 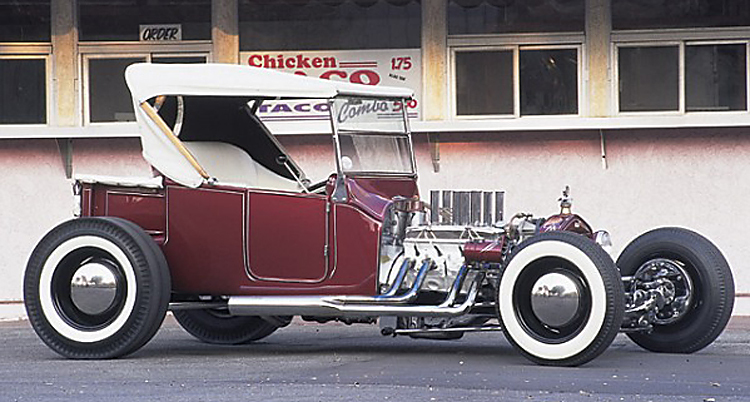 The car has remained original and solid for 55 years. It retained the original 283-cu. inch engine, Powerglide transmission, power brakes, power steering and AM push button radio. 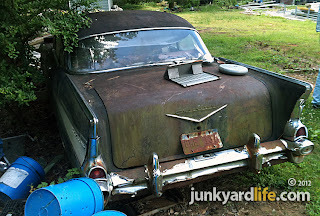 Buck had stashed a boatload of 1957 parts in the trunk and back seat. 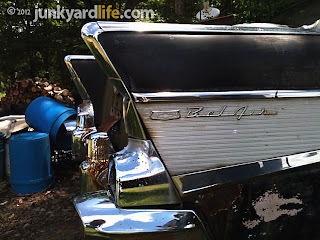 Four 1957 Chevy parts cars remained in Wanda’s yard along with the black Bel Air. Buck's place was a gold mine for ’57 Chevy lovers and word was spreading. 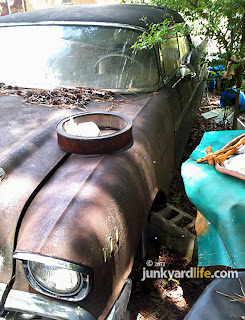 Buck had four 1957 Chevy parts cars in his back yard. I tried to buy Buck’s ’57 before it got away. 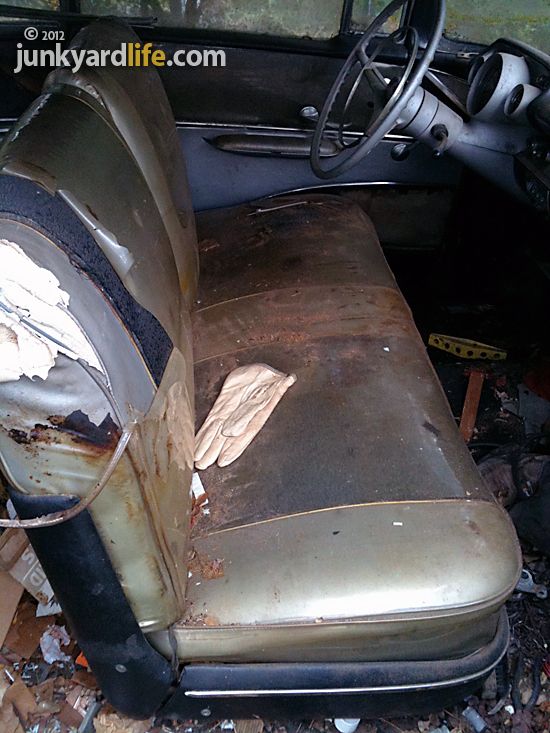 Taking home a ready-to-restore project with a pedigree was tempting. My offer was turned down by Wanda. It wasn’t the first time she said “No” to an offer that month. I promised to keep in touch and wished her well. Two months passed and I got the urge to call her. I didn’t. Another month passed and the ’57 was sold. An older man made her a much better offer than I did. Wanda couldn’t say, “No,” this time. Buck's black 1957 Chevy could draw a crowd. “I know the gentleman will get it back on the road,” said Wanda. 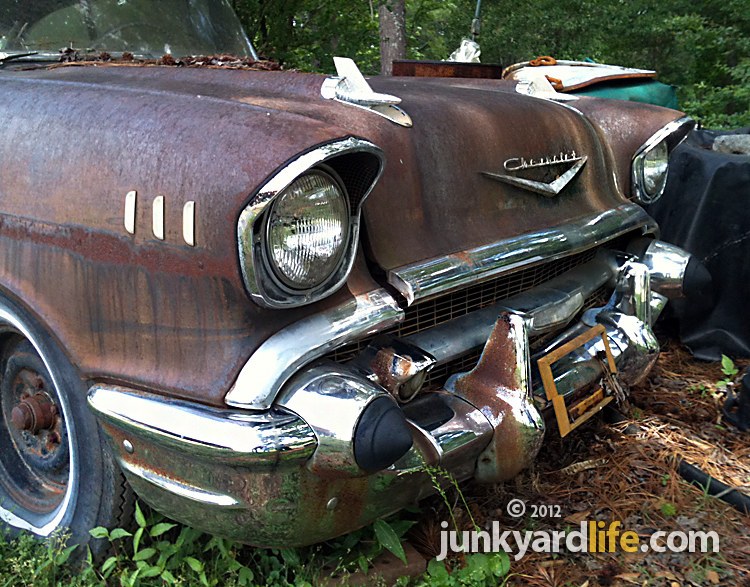 Buck’s 1957 Chevy dream car has found a new dreamer. Plans for a full restoration are underway. Hard-to-find, original ’57 Chevy trim pieces were plentiful. Have you seen a survivor 1957 Chevy lately? 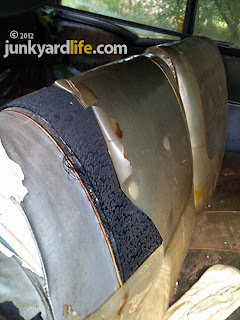 Bumper guards among the options on the ’57 Chevy. Rust-out, at the bottom of one door, can be overlooked on Buck's 1957. Wanda kept a close watch on the Chevy behind the house. 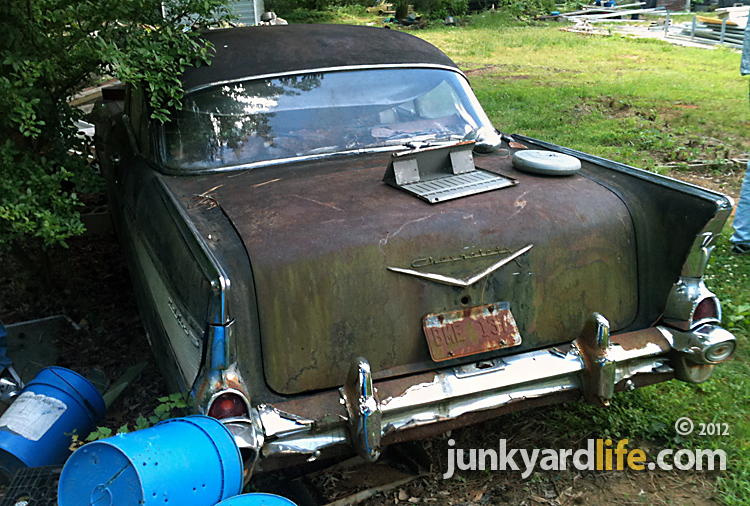 Buck started building a garage for his ’57 when he lost his eyesight. Rear seat of Buck's ’57 Chevy. Buck's car gets a new lease on life. I know he would be proud.